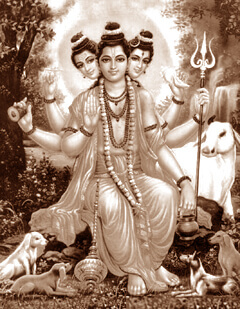 Dattatreya or Datta Guru was India’s first Guru in the tradition of the Nath Sampradaya to which other famous gurus like Gorakhnath and Matsyendranath also belonged. He was born to the great Sage Atri and his devoted wife Anusuya, a sage couple of the Vedic. He is usually depicted with three heads, symbolising Brahma, Vishnu, and Shiva; past, present, and future; and the three states of consciousness: waking, dreaming, and dreamless sleep. The cow, which is always with him, represents the mother earth and dharma. She is the wish fulfilling cow ‘Kamadhenu‘. The four dogs symbolise the four Vedas - the external repositories of spiritual wisdom. The ‘sudharshana chakra‘, disc indicates that He is beyond the cycles of time i.e. the past, present and future and His holding of ‘chakra’ means he is the controller of time. The conch represents the eternal sound ‘AUM’ - which is the manifestation of the spirit. It is also the life principle in us and the cosmos. The ‘bhasma’ ashes indicated his ‘vairaagya‘ dispassion as well as his purity. Ashes indicate the evanescent nature of all created nature of all created objects and the ultimate state of all matter. The japa-mala, he wears reminds us that our primary duty is chanting the sacred name of the lord and meditating on the feet of the Lord, and our redemption depends on this discipline alone.